Back row, from left: Shirley Delair, M.D., UNMC pediatric infectious disease, Haley Mathews, Kevin Real; middle row, from left: Lee Sleightholm, student trip leader, Kaitlin Hehnke, Lauren Greufe: front row, from left: Santiago Rozo, student trip leader, and Sara Pirtle, SAGH adviser and trip organizer. Spring break conjures up images of sunny beaches and a warm surf, but for four first-year UNMC medical students it was a mission trip to the high forests of Nicaragua. The students conducted vision screenings and provided glasses by using the First Sight kit offered by Nizar and Marsha Mamdani's First Sight Foundation. 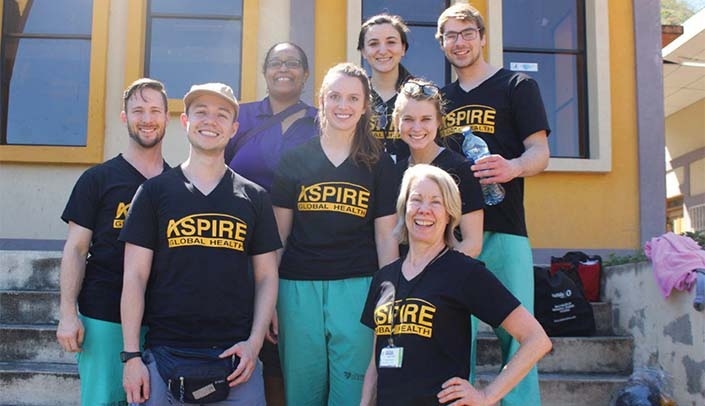 Sponsored by the Student Alliance for Global Health (SAGH), the March trip was made possible through a partnership with Aspire Global Health, a non-profit organization located in Esteli, Nicaragua, the country's third largest city. Students worked in schools and health facilities in Esteli and nearby Jinotega, Nicaragua's coffee producing capital. Assisted by two Nicaraguan physicians, the students screened 161 adults and 135 children. Corrective glasses were given to 143 adults and 20 children at no cost. Sara Pirtle, SAGH adviser and trip organizer, said the group's hosts and clients provided a warm reception. "Our students developed a close camaraderie and were satisfied to know that their service made a difference in the lives of nearly 300 Nicaraguans." The students were relieved that they averted a new round of violence in the country that erupted about a month after they left. "The chaos and civil disobedience continues to grow. We hope that when the dust settles, we can again offer vision screening and other needed medical/health services to Nicaragua." Student Haley Mathews wrote a story that recounted her experience in Nicaragua. It was published in the Nebraska Academy of Family Physicians (NAFP) quarterly publication, Cornhusker Family Physician, in appreciation for a travel grant she received from the organization. (See page 17 of the Spring 2018 issue). Accompanying Mathews on the trip were five UNMC medical students - Santiago Rozo, fourth-year, student trip leader, Lee Sleightholm, third-year, student trip leader, and three second-year students, Lauren Greufe, Kaitlin Hehnke and Kevin Real. They were joined by Shirley Delair, M.D., assistant professor, pediatric infectious disease, and Sara Pirtle, SAGH adviser and trip organizer.